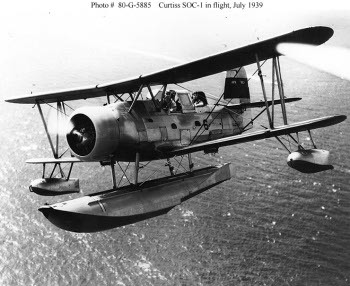 Dimensions 36' by 32'3" by 14'10"
The Curtiss SOC Seagull was the standard seaplane used on U.S. cruisers during the Pacific War. It was equipped with folding wings to facilitate storage in small cruiser hangars. Its floats could be swapped for landing gear to allow it to operate from carriers and airfields. The prototype first flew in 1934 and production began the next year. Production ceased by 1938 and a replacement was badly needed for the rapidly aging aircraft, but this failed to materialize for some time. The monoplane OS2U Kingfisher was used on battleships, where folding wings were not required, while the SO3C was a failure and the SC Seahawk did not come out until quite late in the war.